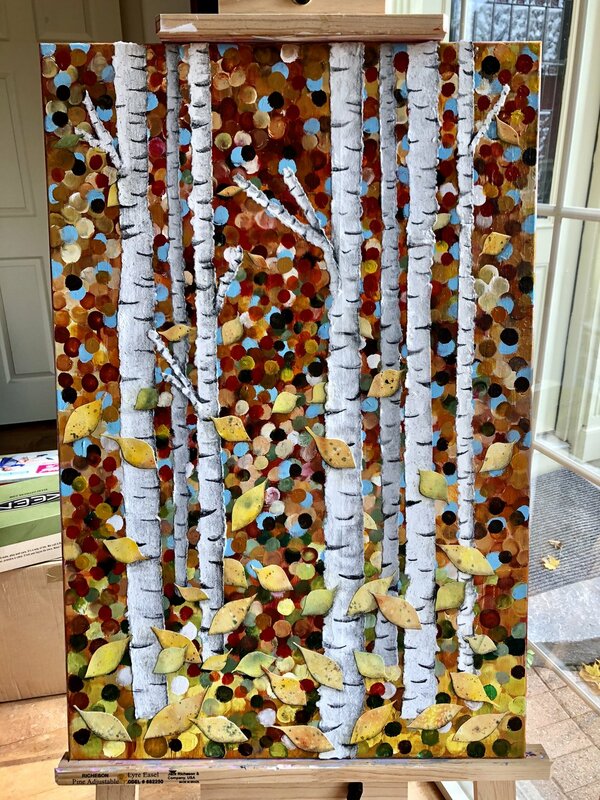 Yes, there is an abundance of paintings featuring birch trees in the world, but these are my birch trees, and I love the fact that they evolved from some simple marks on a canvas. If you have followed Whimsy & Joy for a while you know that I have long strived to understand how to paint intuitively. 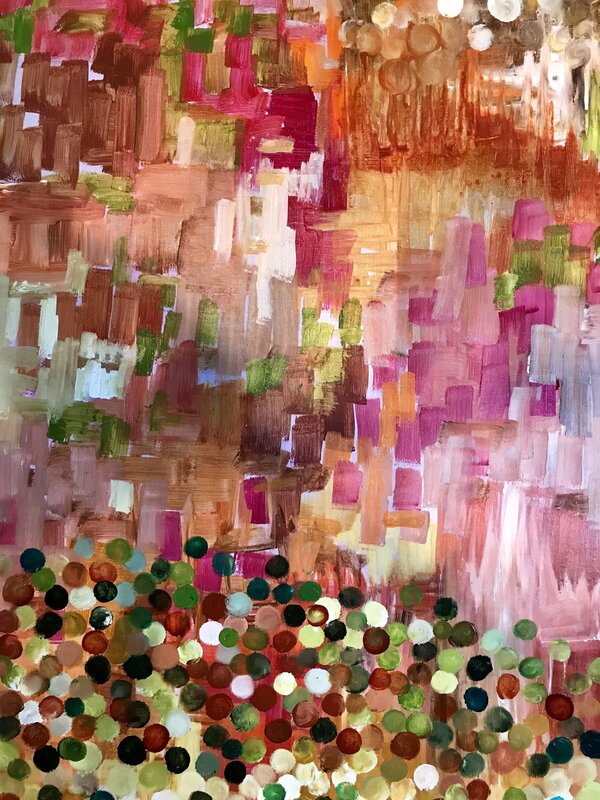 I have taken multiple online workshops with the amazing Flora Bowley, but the essence of putting paint to canvas and letting it guide you eluded me. The canvas and I were always in a wrestling match and I wondered if I would ever come out on top. 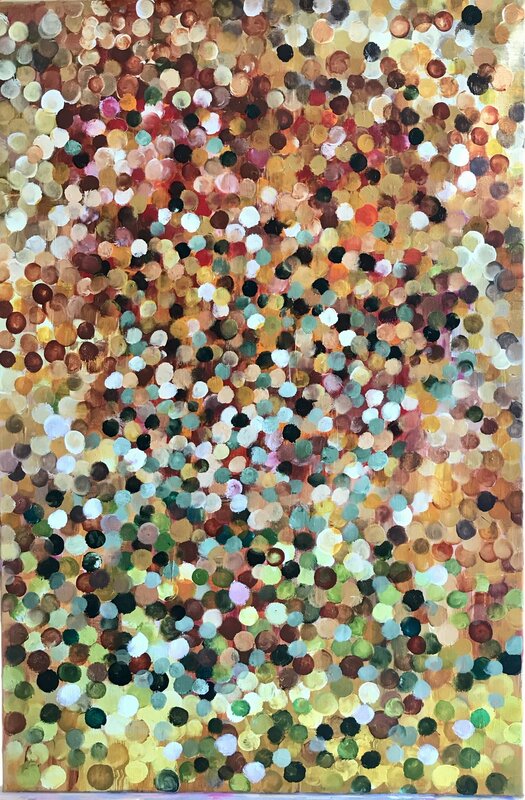 And my mind replied, “Dots,” which is something I had done before and loved because I apply them with my fingers and who doesn’t love finger painting? At this point, I stepped away from the canvas for a while. 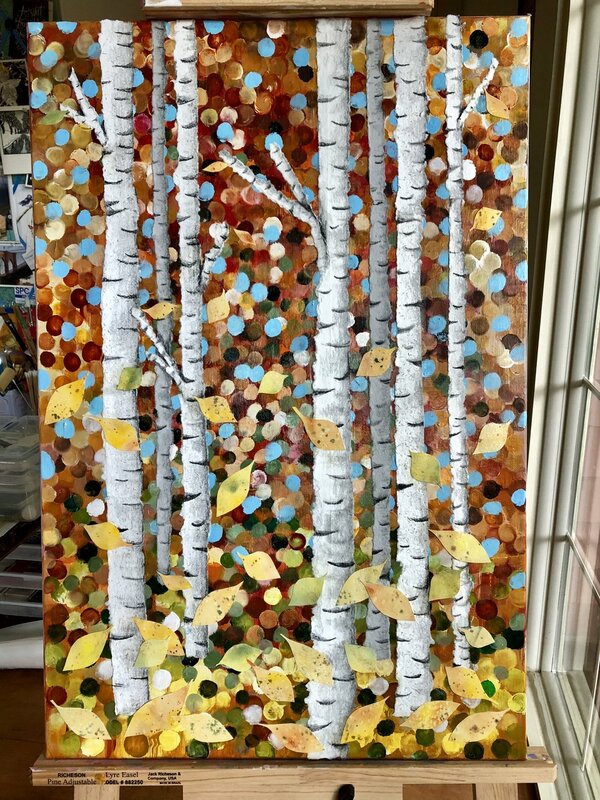 At least a month, maybe a little more, all the while letting it marinade in the back of my mind until I decided that what the painting needed were leaves. I pulled out my watercolor paper and paints, created a multitude of leaves and added them to the canvas. Then, I stepped away once more because it still didn’t feel complete. After another week or so I realized that what I was missing was shading beneath the leaves. I needed to make them pop out, to look as if they were a part of the canvas and not simply decoupaged on. I tucked some leaves behind trees and overlapped others. Using a charcoal pencil, I added shading. One last time I stepped away and studied what I had done. Yes, this time it was complete. During the process of creating this painting I learned a lot about myself. I learned that I need to be patient when creating art. So much of my creative process involves letting ideas percolate and take form in my imagination, as opposed to adding layer upon layer until something appears. I learned that this technique is okay, that there is not just one way to create art. What works for one artist might not work for another. Most importantly, I learned to let go of my own unreasonable high expectations. I may never be a prolific artist but I will always be a happy one because I finally learned to follow my heart. Responding to the prompt ‘taking steps’ from @magnoliayogabr’s November prompts. If you would like to participate, click here. Gratitude Week, Michelle GD’s wonderful (free!) week of prompts focusing on gratitude starts next week! Click on the photo to find out more about this wonderful course.